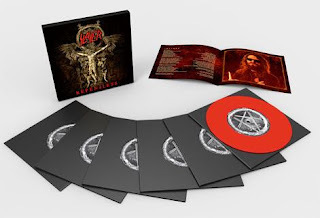 The annual International Day of Slayer is just around the corner - June 6, 2018 - and this year, the day's celebration will begin with the release of Slayer's "Repentless" special collectors edition vinyl box set. The limited edition release will be available in black, red and gold-colored discs, and only 2500 of each color will be manufactured worldwide. Each set will feature six single vinyl EP's, each one measuring a unique 6.66-inches in diameter, and each will contain two songs from the "Repentless" album. The red and black disc versions will retail for $66.66, while the gold disc set will be priced at $73.99. The box sets can be pre-ordered starting today at http://nuclearblast.com/slayer.